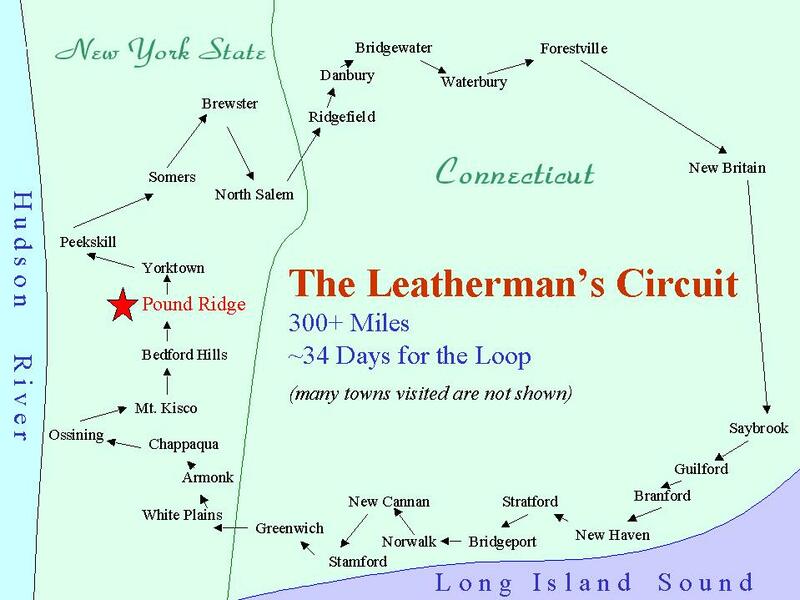 One of the most interesting pieces of Westchester County folklore is the living legend of the Leatherman. The true story of the Leatherman is still shrouded in mystery and controversy. However, even though we may never know the full story of this real person, numerous anecdotes and facts have been collected over the years and new stories about him are still emerging now, having been kept as part of oral history by various families within his territory. There is even a recent book about the Leather Man, written by Dan DeLuca that sheds some new light on the man. Though not purporting to be a full documentation of his life, the information contained on this site may clear up some of the questions that a visitor to Ward Pound Ridge Reservation may have about the Leatherman. In and around the time of the Civil War, around 1860, there were harmless and itinerant wanderers roaming the countryside, usually looking for work on various farms or perhaps a meal or a place in the barn for the night. During this period, there appeared in the area of eatern Connecticut and Westchester and Putnam County, New York, a wandering hermit who was not to be forgotten. He came to the doors of farm kitchens, presenting a striking appearance with his homemade leather outfit, asking for neither work nor lodging but making it clear that he would accept a meal. He did not speak but seemed to mumble incomprehensibly, and made an impression on those who were generous to him by returning regularly every month or so for another visit, and he kept these regular visits up all the year round farmsteads, in some cases for more than 25 years. Gradually, through research of reporters and word of mouth, it became clear that this strangely attired figure, who kept his inner world to himself, was indeed covering a large area of territory in his wanderings; completing a regular circuit in Connecticut that covered the route from north of Danbury toward Waterbury and then following towns along the Connecticut River to Long Island Sound, and then starting west with a large detour round New Haven and Bridgeport as far as Norwalk, where he headed toward New York State by way of New Canaan and Wilton. Thus, it appears that in between this Connecticut circuit he would visit Westchester and Putnam Counties, visiting such towns as Purdy’s, Kensico Village, South Salem, Croton Falls, Yorktown, Shrub Oak, Bedford Hills, and Briarcliff. There are several features of the Leatherman’s life and appearance that give us a deeper understanding of his identity and personality. These were his preoccupation with leather, his hermitlike existence in local caves, his craving for tobacco, and his remarkable appetite. It is clear that the Leatherman was obsessed with leather. He would visit harness shops and accept donations of leather scraps which he sewed together himself into his outlandish outfit. His clothing consisted of a leather hat with visor, a pair of trousers which went well up to his chest, held by suspenders, a leather greatcoat which extended just over the knees, and a pair of wooden soled shoes with leather tops. He also had a bag of leather and carried a cane. In the winter months he wore a scarf under his coat. His costume, weighing a mere sixty pounds, presented a patchwork effect and the leather lacing was rather crude in its workmanship. They say that one could hear the leather creak as he walked by, and there were some that also said you could smell the Leatherman coming! Of particular interest to our story is the Leatherman’s footwear. The clogs that he made closely resemble a type of wooden and leather sabots worn by the peasants of northern France and Belgium. The Leatherman seemed to prefer keeping to himself, living alone in caves or rock shelters that he discovered along his route at regular intervals. He kept his cave very neat with a pine bough or leaf bed, with a fresh supply of wood always stacked up for his next visit. He did not hunt or fish to anyone’s knowledge, and his interest incaves seems to be part of his withdrawn behavior. Some of the more well known caves that he used in Westchester include Bull’s Hill Cave in Bedford Hills, behind the Mobil station, Helicker’s Cave in Armonk, just behind the bowling alley, and the Leatherman’s Cave at Ward Pound Ridge Reservation near Honey Hollow Road. The Leatherman smoked a pipe and enjoyed his tobacco. He picked up cigar butts along his way and gratefully accepted offerings of fresh tobacco or cigars that townsfolk would press into his hand as he walked silently through their villages. Perhaps due to his constant smoking, toward the end of his life he developed a severe lip cancer which ate away the side of his cheek, apparently causing him much discomfort, and possibly being one of the main causes of his death. The Leatherman was known to eat whole loaves of bread and boxes of crackers all at one sitting, and loved his coffee, which is the only food he cooked for himself at his camp sites. Why Did the Leatherman Wander All Those Years? Several families mentioned that they so looked forward to the regular visits of the Leatherman that the wives baked especially for his arrival, sometimes even giving him an extra loaf which he would put in his bag. Another important part of the Leatherman’s personality worth mentioning is that he never harmed a soul, and under his rather terrifying appearance was a harmless and gentle person. He is known to have lost his temper only a few times – shaking his cane and shouting at children who pelted him with rocks; an understandable response, however. What was it that drove this man on his lonely itinerary and why was he so obsessed with leather? The answer to those questions may never be known, but a story did appear in a local paper, The Waterbury Daily American, that purported to be the true revelation of his identity. This story has never been verified and was even retracted by the very newspaper that published the claim not long afterwards. The disproven story is that the Leatherman was a Frenchman known as Jules Bourglay of the city of Lyon. Allegedly, when younger, the young man had a promising career in a leather factory and was engaged to the factory owner’s daughter. Due to a severe oversight on his part, he either accidentally tipped over a lantern late one night and burnt the factory down or another version says that he made a serious error in the accounts which he kept, causing a big loss to the business. The story says he lost his job and was disowned by his fiancee’s father, and having lost all his hopes in life, he took a packet boat to America and became the Leatherman, doing penance for the rest of his life and following the existence of torturous isolation and self-imposed physical hardship. It is a good tragic story and it has been part of the legend for a long time — but the newspaper that made up the story retracted it multiple times after publication. It has been demonstrated to be false by several authorities including Dan DeLuca’s 2008 book about the Leatherman. Mr. DeLuca has said his best guess was that the Leatherman was of French Canadian descent with possible Native American ancestry. The first point is supported by the Leatherman’s documented travels as far north as Montreal and Vermont in the 1860-1870 decade, as well as the French prayer book found in his possession upon his death. The second point is more of an educated guess as evidence at his various caves suggests he kept native herb and vegetable gardens. The Leatherman survived the blizzard of ‘88, but at the end of the winter of 1889, he was found dead in his cave on the Dell farm in Briarcliff. Because he was such a well known personality, a coroner’s inquest was held, during which some interesting facts were brought to light. These facts give a clue to his identity. The Leatherman’s bag was examined at this inquest and was found to contain leather working equipment such as scissors and awls, wedges and a small axe, an extra axe head, and other equipment that made the sack unusually heavy considering that the Leatherman carried this burden as he walked. Of much interest is the fact that the bag contained a small prayerbook which was in French. This piece of information combined with the French style footwear may allow us to conclude that the Leatherman may well have been a Frenchman or French Canadian. The Leatherman is buried in Sparta Cemetary in Ossining, New York. The headstone, incorrectly identifying him as “Jules Bourglay of Lyons, France”, was placed on his grave by local historical societies in 1953. Before that, from 1889-1953, his only grave marker was a metal pipe — which may have been moved in the intervening years. Author Dan DeLuca left 4 pennies on the plain pine coffin that housed the dirt and nails found at the original burial site of the Leatherman. The new headstone and relocated grave were put in the cemetery in May 2011. The Leatherman’s grave site at Sparta Cemetery was exhumed in 2011 in an attempt to find and relocate his remains. No bones or evidence was found other than some nails (possibly coffin nails). The dirt and nails were relocated to another site at the Cemetery and a large headstone marked simply “The Leatherman” was placed at the new site, replacing the 1953 stone marked with a name that was never his. Excavations were conducted in the Leatherman’s Cave on the Ward Pound Ridge Reservation, and though no diagnostic artifacts were found that directly related to the Leatherman, the soil yielded a large quantity of grease that had penetrated quite deep into the cave floor, which was perhaps a vestige of the Leatherman’s cooking activities there. If you would like to find out more about the Leatherman, you can watch the Trailside Nature Museum’s documentation video at Ward Pound Ridge Reservation. Inquire about bringing a school or scout group for the Museum’s Leatherman field trip. The museum staff can provide information about hiking to his cave. And the Leatherman’s Loop 10 Kilometer Trail Run is held annually at the Reservation, an opportunity to reflect upon the life of this most unusual man.